Fall Scottish Music Session 2016 at Iona! We’re back! 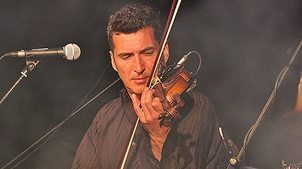 Come join us September 19th with the marvelous fiddler Amy Beshara at the helm, then flutey goodness from our piper pal Will Woodson, September 26th. Iona is at 180 Grand Street Brooklyn NY 11211 and tunes get going around 9pm. Join us for an upcoming Monday. Tunes start at 9pm. Iona is at 180 Grand Street, Brooklyn NY 11211 and you are welcome as a musician or listener. Starting with a Thursday night 6-9pm early bird special session on St. Pat’s March 17th, we have an exciting lineup for the next six weeks at Iona on our regular Mondays. A special night planned for April 4th when we will be celebrating Sebastian McLaughlin’s art exhibit ,currently on show at Iona, with a party from 7-9pm followed by the session 9 – midnight on Monday April 4th. Tonight, Monday March 7th, we have the great piper Will Woodson in. Iona is at 180 Grand Street in Brooklyn, on the L train and along with great music, the bar has food, fantastic beer and a heated garden. 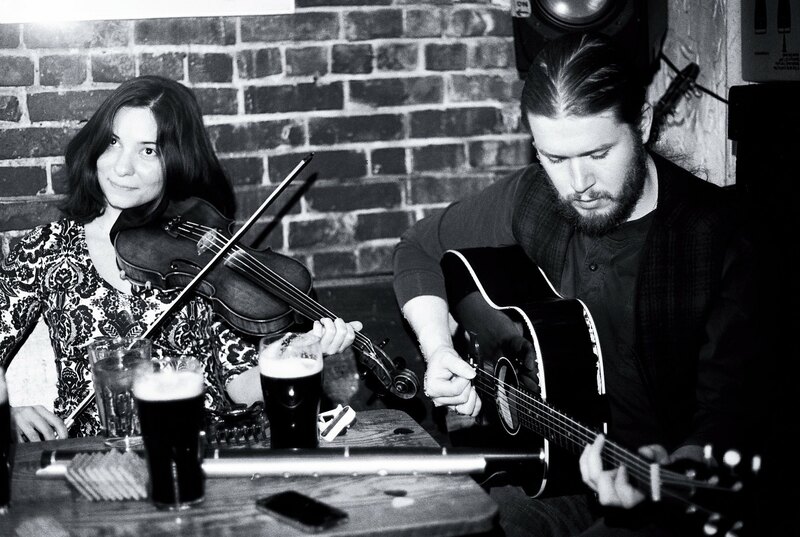 January at Iona – Monday Jan 18th – fab fiddler Amy Beshara will be our special guest from 9pm, Monday Jan 25th the Iona Big Burns night from 8pm, falling on the bard’s actual b’day , with Calum Pasqua and Andrew Forbes in charge of the band, Robert Buchan MC’ing and toasts and songs from gentle persons Pamela Jean Agaloos and J.R. Strauss. Great drink specials and $10 Laphroaig. What could be better. We’ll be keeping going through the holiday season on Monday nights at Iona for some extra Scottish sparkle. This coming Monday December 21st we have the fine piper Andrew Forbes at the helm, and the following week Monday December 28th, Glenfiddich champion fiddler and man of a thousand fiddles, Mr Calum Pasqua. Come down for beer, cheer and chunes on Monday nights from 9pm. We welcome all musical refugees and visiting dignitaries. Iona is at 180 Grand Street Brooklyn at Bedford Ave. 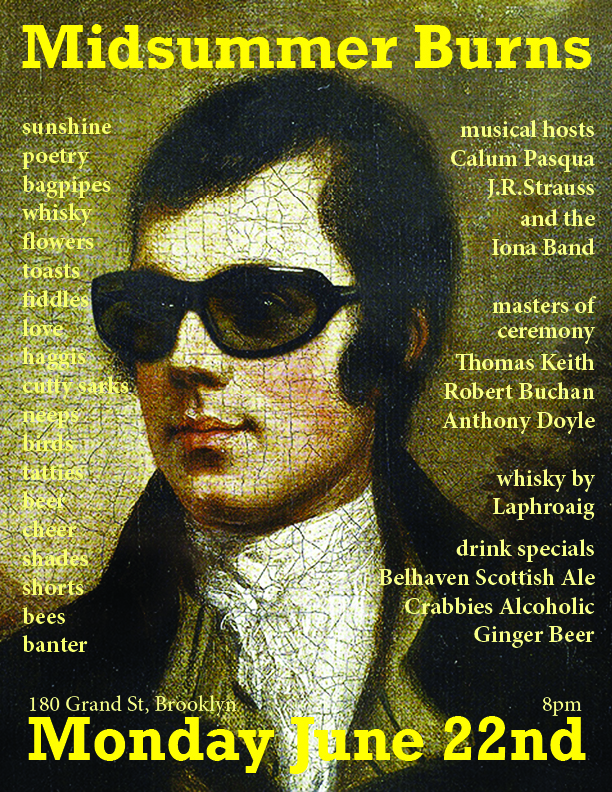 Train is the L to Bedford Ave.
Join us next Monday June 22nd for the inaugural MIDSUMMER BURNS NIGHT at Iona. It’s all about the thrumming, free wheelin’, summer-lovin’ poetry and songs of the Bard, so we’ll be singing, declaiming, bagpiping, and raging around in our cutty sarks, dressing droddums and kissing barefit carlins. From 8pm at Iona, 180 Grand St, Brooklyn 11211. A great cast of characters will be in attendance – Glenfiddich Champion fiddler, Calum Pasqua, Young Wolfetone Andrew Sharp, piper JR Strauss, Burns Scholar, Professor Thomas Keith and the Iona session band. Our Friends at Laphroaig will be offering tastes of their fine whiskies and there will be specials on Belhaven Ale and Crabbies Alcoholic Ginger Beer! CELTIC CONNECTIONS PULSE OF THE WORLD CONCERT Tickets here. We’re super excited to welcome to NYC the tippiest toppermost players of the Scottish traditional music world, playing this weekend at Carnegie Hall. It’s a jam band with a touch of the highlands when Indian ragas meet Scottish strathspeys for The Pulse of the World, an evening of irresistible rhythms with Zakir Hussain—the reigning tabla master who has played with everyone from George Harrison to the Grateful Dead—laying down beats for Scottish fiddlers Charlie McKerron (of Capercaillie fame) and Patsy Reid (formerly of the fiery band Breabach), and master Scottish piper, Fraser Fifield. Pulse of the World is a freewheeling, pulse-quickening, constantly surprising fusion of Indian and Celtic sounds. Tickets here.